Joseph M. Schuster’s absorbing debut novel resonates with the pull of lifelong dreams, the sting of regret, and the ways we define ourselves against uncertain twists of fate—perfect for fans of Chad Harbach’s The Art of Fielding. For Edward Everett Yates, split seconds matter: the precise timing of hitting a low outside pitch, of stealing a base, of running down a fly ball. After a decade playing in the minor leagues—years after most of his peers have given up—he’s still patiently waiting for his chance at the majors. Then one day he gets called up to the St. Louis Cardinals, and finally the future he wanted unfolds before him. But one more split second changes everything: In what should have been the game of his life, he sustains a devastating knee injury, which destroys his professional career. 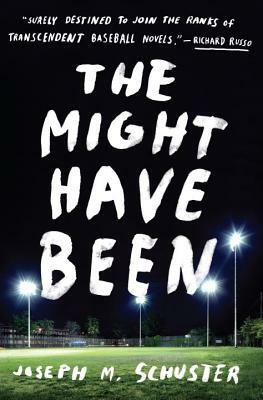 Thirty years later, after sacrificing so many opportunities—a lucrative job, relationships with women who loved him, even the chance for a family—Edward Everett is barely hanging on as the manager of a minor league baseball team, still grappling with regret over the choices he made and the life he almost had. Then he encounters two players—one brilliant but undisciplined, the other eager but unremarkable—who show him that his greatest contribution may come in the last place he ever expected. Full of passion, ambition, and possibility, The Might Have Been maps the profound and unpredictable moments that change our lives forever, and the irresistible power of a second chance. Joseph M. Schuster lives near St. Louis, Missouri, and teaches at Webster University. His short fiction has appeared in "The Kenyon Review," "The Iowa Review," and "The""Missouri Review," among others. He is married and the father of five children.